This new year, there are just as many new and exciting things to do as there are traditional Henderson activities. If you are looking for places to explore, fun events, new food, and ways get your family up and outdoors, this is the perfect guide. The W.C. Handy Blues and Barbecue Festival is held for 4 days in June. It has become one of the largest free music festivals in the nation, and celebrates the life and legacy of Henderson native W. C. Handy through lots of music, food, and good company! The Sandy Lee Watkins Songwriters Festival held in July showcases some of Nashville’s biggest singer/songwriters through intimate acoustic performances. It creates an up close experience for attendees, along with a chance for them to learn the stories of how and why from the songwriters themselves. Bluegrass in the Park, held in August, features live bluegrass music, food, folklife displays, children’s activities, and more. Visit the John James Audubon Museum and State Park for one of their arts and crafts events, workshops, trail tours, or unique exhibits! Visit the Community Room to see exhibited history of Henderson, or attend one of their walking tours, such as: Taste of Henderson, Fernwood Cemetery, or Bird Statue Tour. Research your roots in Henderson through the Historical & Genealogical Society. You can find information such as bible records, churches, census records, cemeteries, family pages and a brief history of The Depot. 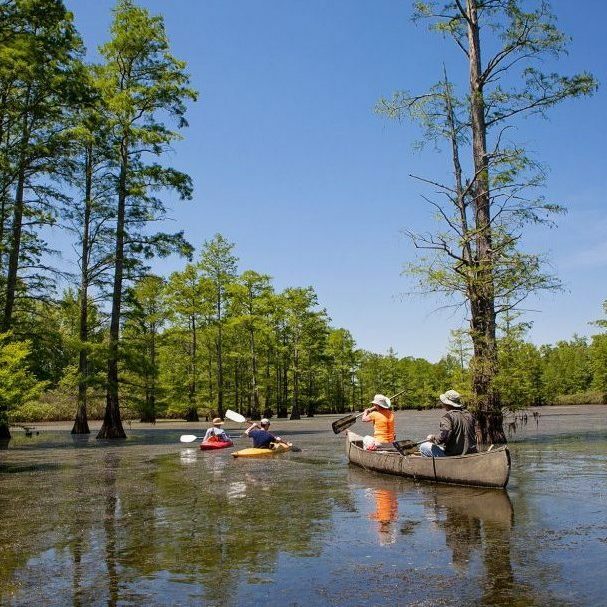 Go canoeing through the Sloughs Wildlife Management Area. Divided into wetlands, woodlands, ridges, and open fields, this area is the perfect spot for fishermen, campers, hikers, and nature enthusiasts. Enjoy live racing from early July through Labor Day at Ellis Park Race Course, or attend one of their special events such as wiener dog races, ostrich races, and camel races. Explore Henderson’s nature scenes by taking a walk on the Atkinson Park Riverwalk, through the Sandy Lee Watkins Community Park, or visit the Audubon Wetlands Boardwalk. During the spring and summer, this trail has the best up close views of wetland wildlife. Check out the OVAL Gallery at The Citi Center Building is a myriad of yearly exhibits that include fine arts, fiber works, mixed media, and photography. Visit the Rotunda Gallery located on the top floor of the library is a historic space that offers rotating nature and art exhibits. See a live performance at the Preston Arts Center at HCC. Top vocalists, children’s science shows, and many other exciting shows visit each season. Have a date night at Farmer and Frenchman Winery, where you can dine on the deck, sample wines, and see the fully refurbished 1940’s tobacco barn. Visit the Henderson Farmers Market at the Fairgrounds from May-October. It is the place to go for fresh produce, local honey, delicious jams, and more! Try different local restaurants in our ever-growing food community. Here, you can find a taste of everything from barbecue, seafood, sandwiches, and ethnic cuisine. If you’re looking for a new piece of furniture to put the finishing touch on your home, visit Alles Brothers Furniture Company who has been furnishing Henderson homes for 115 years. Handmade soaps and lotions are a couple of sweet smelling ways to treat yourself. Lucia Soaps Etc LLC is the hot spot for local, handmade soaps and lotions! If furniture and soaps don’t hit the spot, there are lots of local boutiques and shops that are guaranteed to do the job. The Gold Mine, J Petals Flower Shop & Gifts, Paisley’s, Sweet Peas Gift Shop, Third Street House, Tip Top Design Company, and Victoria’s Boutique are some of the boutiques and shops that Henderson has to offer. Henderson is home to a number of special events and unique activities year round. For more information on the latest happenings and can’t-miss experiences, check out our community calendar, and be sure to check it throughout the year for new and updated events!